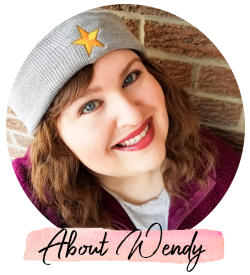 I want to apologize if you came to my blog during my birthday break and had to see the issues I was having with a few graphics that I had linked to my Photobucket. They decided to change their whole website without telling anyone. Now to link to your pictures on there, they expect $400 US a year. Keep dreaming, Photobucket. Luckily, I only had a few to deal with on my main page. But you will see some past posts with an issue. As for my birthday, I'll have a post up next week. I just needed a little break to enjoy it! While on my break, I took in a spectacular show. 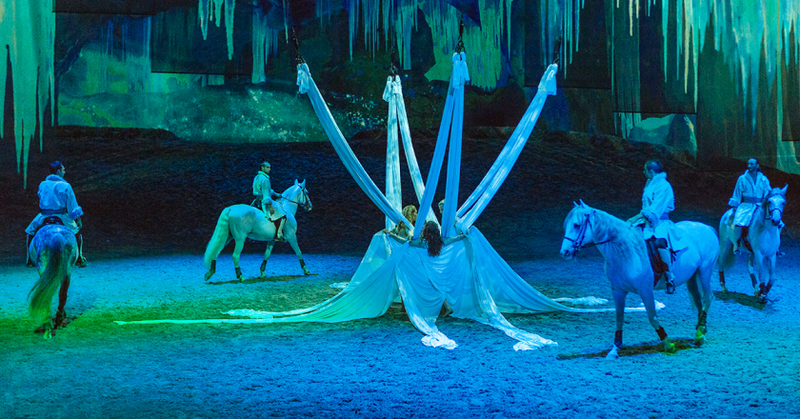 I saw Cavalia when it first came to Toronto forever ago (pretty sure it was 2005) and fell in love. 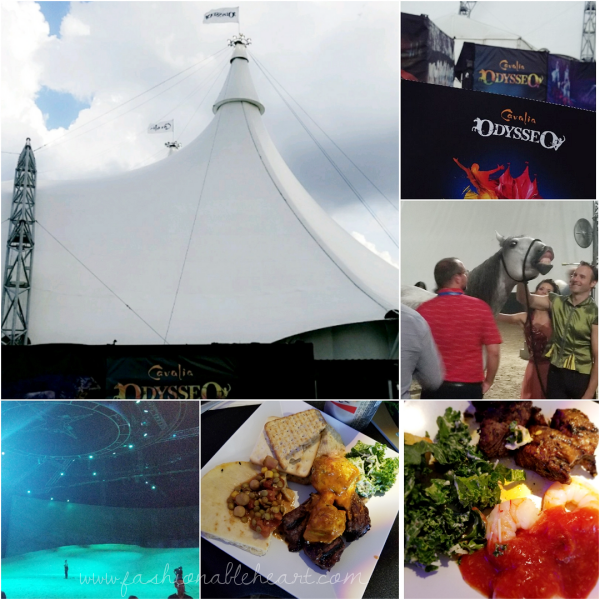 They then started the Odysseo touring show, so I jumped at the chance when I got invited to attend during Social Media Week. My husband and I went on Friday (July 7) and I specifically chose that day because it marked ten years since I lost my grandmother. I wanted to do something fun and emotionally moving at the same time. When seeing Cavalia, I remember being in absolute awe the entire time. 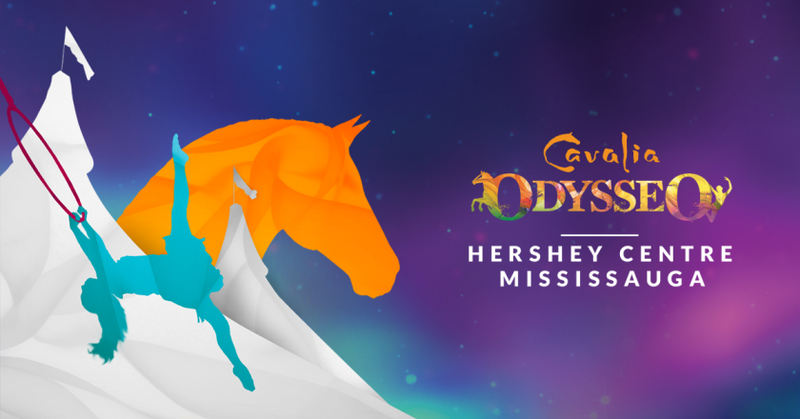 Odysseo is no different. In fact, I seem to still be missing my jaw. I think I left it behind on the tent floor! Continue reading for more of my thoughts and to see the pictures. I have tried to cover a lot of the VIP (and regular none VIP) experience. There's also a discount code below if you are in the GTA and interested in going! These two pictures above were two of my favorite scenes. 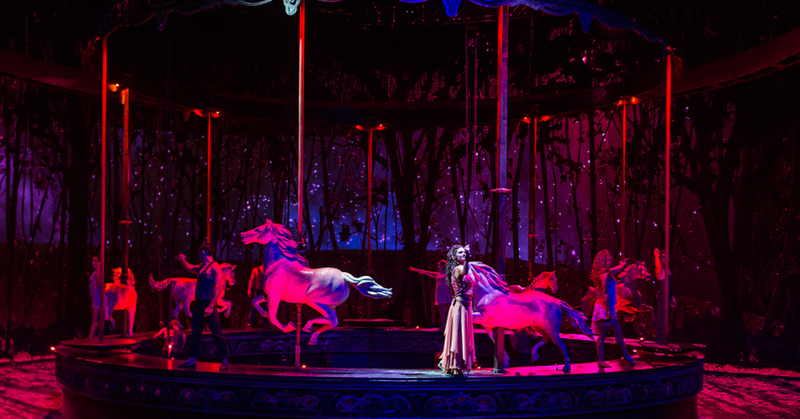 The carousel is visually stunning as it spins. You can see Valentina in that picture. She sang throughout the show. As someone who grew up in chorus and band, I can't say enough good things about the live music. There are rafters on both sides of the tent that house the musicians. It adds so much to the show! I don't know about you, but I always hold my breath when I see aerial silks. I know that I am going to be seeing them run it around their body and go flying down. I will never feel at ease watching it, but yet I can never look away. It's worth it in the end, even if I am blue in the face from forgetting to breathe. The whole show is close to 2.5 hours, along with a 30 minute intermission. Every second is full of beautiful scenery, trick riders, acrobatics, and horses. Can't forget the horses! Not to rain on the parade of all of the performers, but the horses steal the show. From forming circles to galloping freely. From rolling around in the dirt to splashing in the water during the grand finale. This show celebrates horses from beginning to end. Now to a few of the pictures I took during my night there. You're not supposed to take any during the show. That's fine with me, because it was nice not to watch a show through my phone. These are all from before and after. If you followed my Instagram Story and Snapchat, you probably saw most of these and then some. This is where I am going to talk more about the VIP experience! When coming off the highway, the white tent was easy to see. I was given my Rendez-Vous VIP lanyard and seat tickets when I arrived. There is a special VIP tent and area with bathrooms, a boutique, and buffet and drinks. We sat down to a tasty meal. I'm not just saying that. As a foodie, I refuse to say something is good that isn't. I think I have a new favorite with the lentil dahl. I had never had that before! After dinner, we grabbed our popcorn and drinks and headed to our seats. I was in row DD, which is the fourth row. It does not matter if you are hugging the stage or at the far back, you will have a good seat. There is not a bad seat in the tent. I didn't see this noted anywhere that I looked, but knee room is tight if you're tall. I'm 5' 9" and my knees were almost touching the seat in front of me. The seats don't have armrests, so that part is comfortable. Just something to keep in mind when choosing your seats. You might prefer an end seat to stretch out a little, if you have longer legs! From there, we headed to the backstage area where there is a steep dirt hill to get up. If you're not new to my blog, you know that I suffered my Tibial Plateau Fracture by falling down a hill. I learned my lesson and stayed behind. I don't think my knee would have been capable anyway. Hills give me instant anxiety, so I snapped this quickly and went right to the stables where my tour was headed next. The stables were great. They had just fed the horses, so it was fun watching them eat and take it easy after the show. The warm-up area and backstage tour was only for Social Media Week VIPs, I believe. 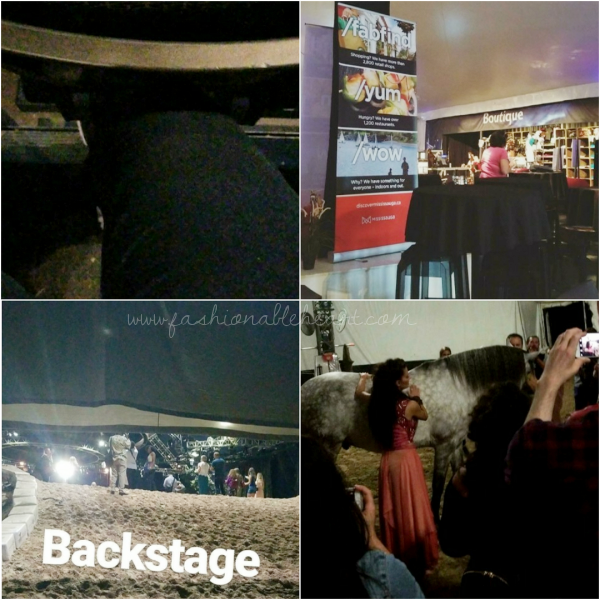 But with VIP packages, you do get everything else including the stable tour. There are three different tiers of VIP: Silver, Gold, and Premium. My tickets were for Rendez-Vous VIP Gold. On-site parking can be bought online or at any cashier for $15. I bought it online to save time. I think that covers everything, at least the main points. I'm happy to answer anything else. I'm so very grateful to have my blog and to get to have experiences like this. I thank each of you that visit my blog and follow along with me on social media. 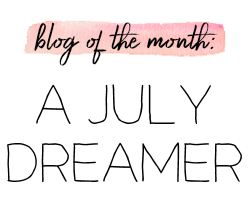 I started this blog as a hobby, but it has given me a voice and so much more than I ever imagined. Thank you, thank you, thank you! If interested in purchasing Gold or VIP tickets, you can use code "SOCIAL" to save 15%. This code is good until July 23, 2017.